I can’t wait to have a new blog set up that will display these photos properly. The ball in motion in the air, the child practicing while the parent offers instruction, but most of all the little guy sitting and watching. 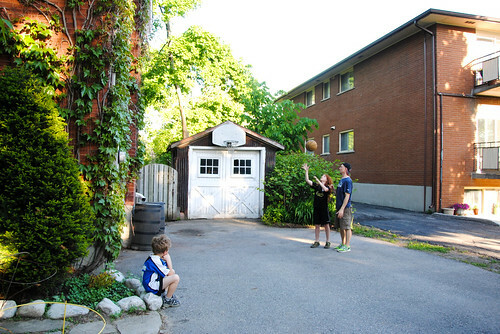 We had such a fun time together that evening, shooting hoops. This photo captures something outside of that experience, though, and seems to communicate a separate narrative that may not be the real one, but strikes me as being, instead, extremely poignant. There is a loneliness to the child in the foreground, watching, waiting his turn, hand resting on chin. And all around, the green of nearly-summer, the bright, angled evening light.